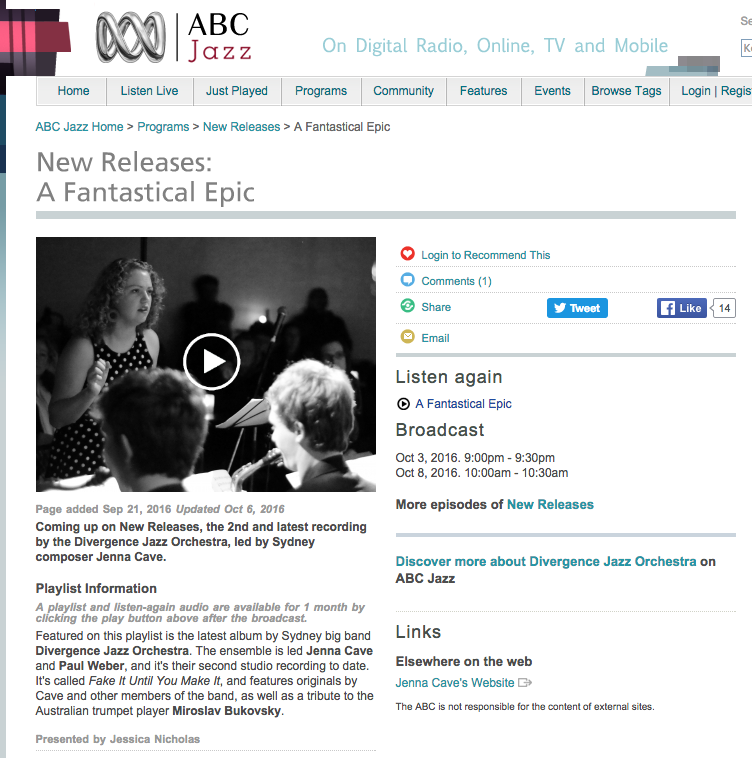 The new Divergence Jazz Orchestra album Fake It Until You Make It was reviewed and featured as "Album of the Week" on Sydney arts radio station Eastside FM. Read what the folks at Eastside FM had to say about it. On Thursday 13th of October Jenna will sit on free panel discussing the successes of Australian women in the jazz sector and the progress being made by our trailblazing women composers and performers. This will finish with a sextet performance of her piece And Then There Was One by players from the Divergence Jazz Orchestra. The Divergence Jazz Orchestra is made up of nineteen of Sydney’s most accomplished young musicians led by Jenna Cave (conductor/composer) and Paul Weber (trombone). Their sound brings the spirit and tradition of improvised jazz music to the 21st century big band; where captivating grooves, memorable melodies and expressive orchestrations are executed with outstanding musicianship and soul with rhythm as its cornerstone. Following a highly acclaimed debut album release in 2013, the Orchestra now releases 'Fake It Until You Make It' - a brand new CD, featuring original music composed by Jenna Cave, Brendan Champion, Luke Davis, Paul Murchison and Miroslav Bukovsky - performed by some of Sydney‘s most versatile young jazz musicians. A jazz orchestra typically consists of four trumpets, four saxophones, four trombones and a rhythm section that includes piano, guitar, bass and drums. It is a cohesive musical group that provides a big, powerful sound. Itis also a framework that allows the key ingredients of jazz to unfold. This particular jazz orchestra, Divergence, was formed in 2011 by composer Jenna Cave and trombonist Paul Weber, their goal being to perform newmusic by jazz composers. The orchestra was set up to be a community that provided a space where composers and musicians could come together, explore ideas and make music. Jenna Cave describes a jazz orchestra as 'a powerful, fun, exciting, emotional and awesome thing'. The evolution of the jazz orchestra has made it a more cohesive orchestral pallet of colours and sound, giving composers of the style much more scope within the framework. 'I think [the jazz orchestra] can be anything today. In the days of the big band/swing era, big bands obviously played mostly in one style, swing, but these days people use a jazz orchestra as an instrumentation rather than a group which must play in pre-prescribed style, ’ Cave says. Each tune on this album contains that zest, energy and buzz that are at the core of Divergence Jazz Orchestra’s principles and affinity for groove that accentuates the validity and freshness of a jazz orchestra in today’s musical landscape. All of the compositions on this release show originality, and the mix of sound worlds vary from swing to New Orleans to gospel ballads featuring luscious harmonies, exciting writing and all of the features that make for a top-notch jazz album. In this recording Her Place was performed by Dawn Bennett. 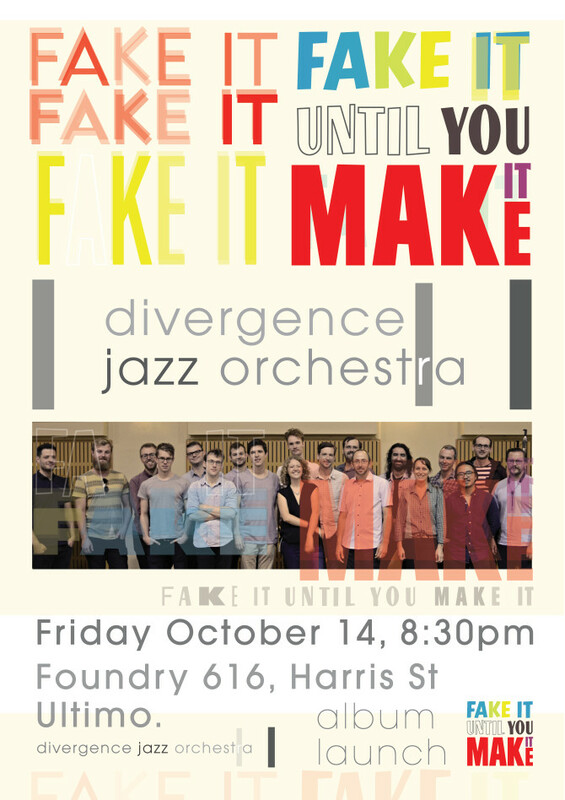 Fresh from the recording studio, Divergence Jazz Orchestra will perform new material from their upcoming album release. The performance will include the premiere of new pieces by Jenna Cave and Brendan Champion, as well as music by Luke Davis, Miroslav Bukovsky and Paul Murchison. Cut Common Magazine have just published an article by Samuel Cottell about Divergence Jazz Orchestra's upcoming album recording, our crowd funding campaign and Jenna's thoughts on various things music. Check it out! We are now four years old as a band and It’s been three years since we’ve recorded our first album. A lot has changed in that time and we have developed our sound as an ensemble. Through our work developing and performing new Australian music we’ve accumulated a large collection of music which is yet to be recorded. After the success of our first album The Opening Statement in 2013 we have launched a new crowd funding campaign to raise the funds to record and produce our second album in 2016! This will include some favourite pieces from band members including Jenna Cave (5 pieces), Brendan Champion (2 pieces), Luke Davis, and tunes from other Australian composers such as Miroslav Bukovsky. These tracks will include a wide variety of influences and styles, from contemporary jazz, New Orleans 2nd line, gospel ballads through to pop and groove; pushing the envelope of large ensemble jazz while staying rooted in rhythm. We also want to feature some of our great soloists including Will Gilbert (Trumpet), Tim Coggins (Trombone), David Reglar (Tenor Saxophone), and Andrew Scott (Piano) amongst others! Our friends can pledge to pre-purchase the new album or be thanked with a range of other rewards. See more/pledge on our pozible page. Under Cave’s direction, the DJO brings the spirit and tradition of improvised jazz music to the 21st century big band. Captivating grooves, memorable melodies and expressive orchestrations are executed with outstanding musicianship and soul with rhythm as its cornerstone. At this performance at Foundry616 Divergence will present a show of toe tapping and evocative music, from New Orleans second-line, contemporary jazz, flamenco, pop epics to gospel ballads. With Jenna Cave at the helm, Divergence Jazz Orchestra are performing at the 4th annual Sydney International Women's Jazz Festival, an outstanding showcase of Australian and International female jazz talent. In the final instalment in our 2015 collaboration with Miroslav Bukovsky (trumpet), we will feature him as a guest soloist on a set of his music arranged by the band. Other works by Jenna Cave, Jessica Wells and Brendan Champion. Tickets are selling fast, book now to avoid disappointment. 4:oopm, Sunday 27 September At this performance Divergence will be joined by Australian jazz legend Miroslav Bukovsky (trumpet) as guest soloist. We will be presenting our own arrangements of some of Bukovsky’s classic 10-part invention tunes alongside Divergence originals including a brand new piece by Jenna Cave. Other charts by: Luke Davis, Brendan Champion, Paul Murchison and Justin Buckingham. Following Divergence three other bands will be performing. Tickets are valid for the whole evening. We've had some international radio play recently. In April our debut album The Opening Statement was featured on Flagler College Radio, in St. Augustine, Florida, alongside a recording of Jenna's String Quartet no. 1. In June we received an email informing us that our album was featured on Chicago's jazz Radio www.WDCB.org. Divergence Jazz Orchestra are thrilled to announce that we will be performing at this year's Capital Jazz Project in Canberra. The Capital Jazz Project features a diverse range of international, national and ACT-based artists. The 2015 line-up includes: virtuoso piano-bandolim duo of Stefano and Hamilton (Italy/Brazil), jazz-rock icons The Bad Plus (USA), Grammy-award winning saxophonist Joe Lovano with Paul Grabowsky (USA/AUS), sublime vocals of Katie Noonan and Elixer (AUS), hard bop combo Hammerhead (AUS), master drummer Eric Harland (USA) and big band Divergence Jazz Orchestra(AUS) (that's us!). This performance will feature music by Jenna Cave, who grew up in Canberra, with a guest appearance by her former composition teacher, Canberra-based Australian Jazz legend Miroslav Bukovsky. Jack Bowers, resident big band expert who contributes to international jazz blog 'All About Jazz' had some nice things to say when he reviewed our 2013 album 'The Opening Statement' on the site this month. Thanks Jack. Read his thoughts here. 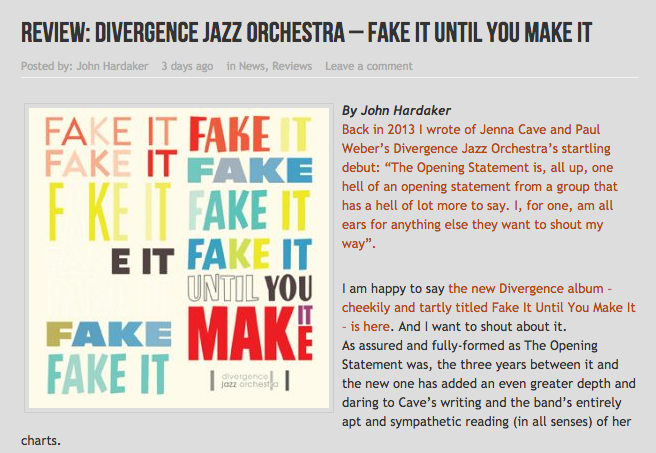 "Divergence Jazz Orchestra is remarkably strong and consistently pleasing... Cave writes with depth and maturity well beyond her years, a virtue not lost on the DJO, which carries out her wishes to the letter." Wash away the back to school blues by joining Divergence Jazz Orchestra with a fun night of original Australian big band music at Foundry616 on Wednesday February 4 2015. Hear some home-grown music in a variety of styles spanning from swing, bebop, fusion, flamenco, west African and contemporary jazz, performed by 19 of Sydney’s most sought after creative musicians with Jenna Cave and Paul Weber at the helm. This performance will feature music by Jenna Cave, Bill Motzing, Rafael Karlen, Jessica Wells, Cam McAllister and Justin Buckingham. An interview with Jenna plus recordings of her music have been featured in a documentary feature on ABC Radio National called 'Holding the Tune' by Camilla Hannan. The program examines the creative lives of five female Australian composers. Check out the article and listen to the podcast here. We are excited to announce that on November 6 ABC Jazz will be broadcasting a special recording ABC made of our live perfomance at Foundry 616 in September this year. The live set will be broadcast as part of their Thursday Night Live series in conjunction with Aus Music month. The set will feature tunes by Jenna Cave, Brendan Champion, Cam McAlister and Rafael Karlen, and will go to air on ABC Jazz (digital and online) at 9pm, Thursday November 6th 2014. For more info check out the ABC Jazz site.